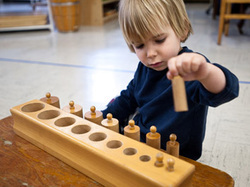 An Montessori teacher is trained to introduce your child to many activities and concepts each day, based upon her unique development. The learning, however, is not so much taking place in the lesson, as it is through independent activity when she comes back to explore it, repeat it and perfect it. An certified Primary teacher has completed a rigorous one year graduate level course of study in child development and Montessori philosophy according to standards set forth by Dr. Montessori. He or she is trained to guide a classroom of 28-38 children. The untrained assistants in the classroom are available to help children if needed, but are instructed not to interfere with a child’s concentration.